It's probably safe to say that only Grant Lawrence could make me read a hockey book. The quintessentially Canadian CBC host has a self-deprecating approach to storytelling that usually elicits more than a few coffee-spewing snorts out of my nose. His memoir Adventures in Solitude: What to Wear to a Naked Potluck and Other Stories from Desolation Sound, which I reviewed in 2011, was one of the most engaging books I had read in a long time. Surely if anyone could make a book about hockey enjoyable, it would be Grant Lawrence? 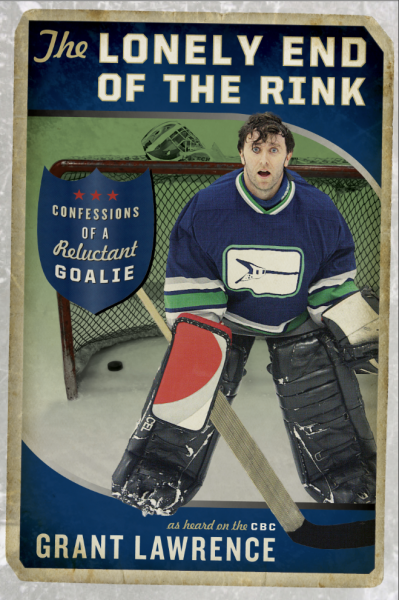 Lawrence's reminiscences about his long, often painful, journey from small, bespectacled, knee-braced bully target in elementary school to Vancouver Canucks-loving (albeit still insecure) goalie in a championship-winning beer league hockey team is a surprisingly informative read. Lawrence weaves the history of NHL championship battles - primarily those involving the Vancouver Canucks - throughout his narrative. And although I generally only had a passing familiarity with many of the hockey names mentioned, the history of the game is rich enough with oddball characters and nail-biting suspense to keep even a non-athlete like myself entertained. Lawrence is at his best when relating his own personal history. His tale of growing up the decidedly non-athletic child of two very athletic parents is vintage Lawrence story-telling at its finest. As in his earlier book, Lawrence borrows song titles as chapter titles, a practice that I admit to indulging in myself. There's that feeling of being part of the inner sanctum when you recognize and understand the significance of the name. I admit that I enjoyed Adventures in Solitude somewhat more than The Lonely End of the Rink, but I am pretty sure that lies in the fact that I am more interested in the hippie counter-culture of the inappropriately-named Sunshine Coast than I am the Vancouver Canucks. Strictly a personal preference. Now I just have to convince the Spousal Unit - for whom I bought The Lonely End of the Rink as a Christmas present - that it's time to read. I like goalies. When I was growing up, Johnny Bower and his family lived around the corner from our house. It was pretty exciting for the local kids to have an honest to god hockey hero living down the street. It turned out he was a down to earth regular nice guy. Goalies are people too. Who knew? How heartening to hear that goalies are regular folk, Eugene. I bet he even gave out good Hallowe'en candy (the true test of a person's character).